I got my bandages off my left hand on Sunday night. My incision looks like it is splitting apart, but my surgeon said that this is what happens as it heals. 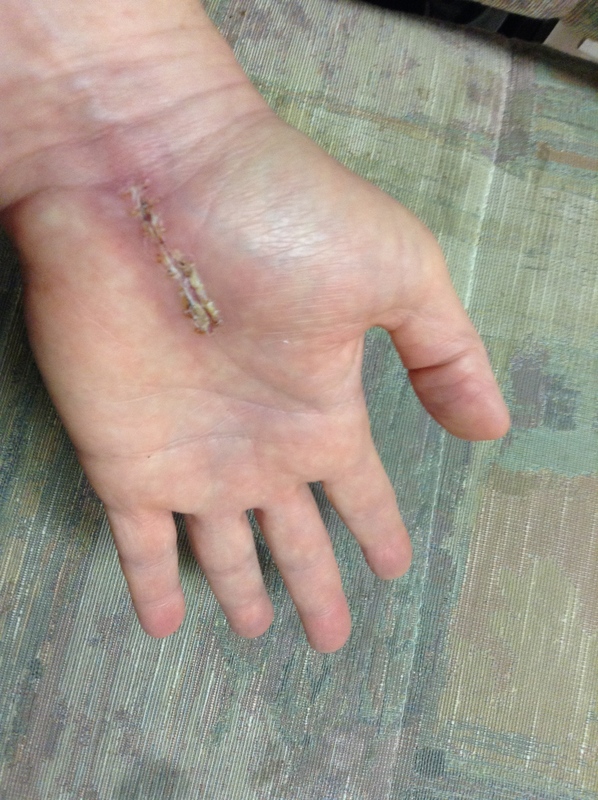 I am posting a picture for those who have no idea of what carpal tunnel surgery looks like.I still lack strength in my hand, but that should return somewhere from 6 weeks to 6 months. The area around my wrist is swollen, but this is because the carpal tunnel has been released, so everything has more space to occupy. The carpal tunnel pain is gone, and all that is left is the pain from the cut muscle. Mostly it is just the incision that is bothering me right now. My right hand is not too happy and bumping the wrist brings a lot of pain. I will be glad to have a second operation done so that I can be pain-free again. There has been so much going on in my life that is complicated. I wish I could tell the story here. Now is not the time. Perhaps someday when the dust has settled, and my DVD work completed, I will record my story. I want to see how it ends first. Thank you to all who have been praying for me! I honestly never thought that there would be so many side effects from cancer treatment. I am hoping that these two surgeries are the end for awhile and that I can rest in peace as I seek to serve God. You have been so brave! I used Mederma cream (over the counter) to help the scar fade, but I would ask your doctor when the time would be good for that. It made a huge difference. Besides the pain? Mine was itchy! The scar that is.